1. Register your class to be part of a 14-week global iEARN Learning Circle. 2. Join the A Vision Creative Writing Anthology. 4. Sign up for the Holiday Card Exchange. 5. Daffodil and Tulip Project to start in September. 6. Pawnee Nation participants to join Early Peoples Symbols Project. 7. Tagging My World Project. 8. School Uniform Exchange Project. 9. The Magic of Water Project. 10. Finding Solutions to Hunger Project. 11. Register now for the next session of iEARN-USA's 8-week Online Professional Development Courses for educators. 12. iEARN - End Malaria Campaign 2010 Botswana Report. 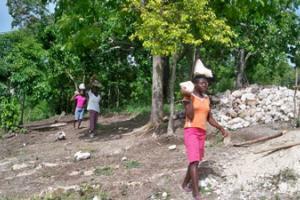 13. iEARN students in the Natural Disaster Youth Summit Project help build kitchens in Haiti. 14. New closing date for Stockholm Challenge 2010. 15. 2010 Natural Disaster Youth Summit in Turkey, August 23-27, 2010. 16. Online Global Education Conference, November 15-20, 2010. 17. 2011 iEARN Annual Conference and Youth Summit in Kaohsiung, Taiwan, July 17-23, 2011. 18. National iEARN-Slovenia Workshop, August 24, 2010. Download the 2009-2010 iEARN Project Book (available in English, French, Spanish, and Korean) or View full listing of iEARN projects. 1. REGISTER TO BE PART OF A 14-WEEK GLOBAL iEARN LEARNING CIRCLE. Register now for the September 30, 2010-January 12, 2011 session (15 weeks with a 1-week break in December). Learning Circles are highly interactive, project-based partnerships among a small number of schools located throughout the world. There are two sessions each year, September - January and January - May. All interested educators should register by filling out an online iEARN Learning Circle Placement Form by September 15th, 2010. If you have questions about Learning Circles please check our Frequently Asked Questions. After you fill out an online registration, you will be contacted on or around September 15th with more information on how to finalize your registration and confirm your project choice and placement. 2. JOIN THE "A VISION" CREATIVE WRITING PROJECT. From the facilitating team in the Philippines - "The A Vision 2011 Team is currently brewing up another year-worth of fun and learning, and we are inviting you to join us and share your creative works with the world - this world is never too full for another poem, story or whatever piece of art you can think of. So never hesitate to post your works here in the forum, browse through others' works and comment on them, learn from others' experiences, and have fun!" Facilitated by Maria Luisa Larcena and Michael Clunies-Ross in the Philippines. For more information, and to connect to the project forum, visit the iEARN A Vision project page. 4. HOLIDAY CARD EXCHANGE. Teachers and students prepare an envelope with holiday cards to send to the other participants between October - December. Students could send Chinese New Year, Christmas, Hanukkah, Kwanzaa or Eid greeting cards. Each school will be placed in a group with approximately seven other schools and will prepare either handmade or purchased cards (decorations may be included) to send to each of the other schools. Please note: This project involves postal mailings, so participants are encouraged to plan ahead to estimate whether associated costs are within their budget. Facilitated by Judy Barr in Australia. See the iEARN Holiday Card Exchange project page, and register in the Holiday Card Exchange forum. 5. DAFFODIL AND TULIP PROJECT. Join students in different parts of the world in planting bulbs together, collecting data on various parameters (latitude, longitude, sunlight, temperature etc. ), and tracking when they blossom. Project starts in September. Facilitated by Ruty Hotzen in Israel and Amy Dwyer in the USA. See the iEARN Daffodil and Tulip project page and google site. 6. EARLY PEOPLES SYMBOLS PROJECT. A project to explore early peoples’ symbols and their cultural history. Recently, Mr. Chris Hill, Education Director of the Pawnee Nation, has joined the global Early Peoples Symbols to bring Pawnee Nation educators and students into the project. Facilitated by Abdelaziz Rhazzali in Morocco, and Chris Hockert and Christine Kolstoe in the USA. For more information, and to connect to the project forum, visit the iEARN Early Peoples Symbols project page. 7. TAGGING MY WORLD PROJECT. Students research and analyze various artists and styles - brainstorming teenage interests, values and issues collecting images that symbolize them, and comparing them with peers from other countries. Participants are invited to combine ideas and images, creating a mural, either individually or in groups, that will convey meaning and represent aspects of their identity. Artwork will be shared using the web, mail and project events. Facilitated by Mary-Louise Scappaticci-Olajos in Canada. For more information, and to connect to the project forum, visit the iEARN Tagging My World project page. 8. SCHOOL UNIFORM EXCHANGE PROJECT. A new project for students to exchange their school uniforms and talk about the specifics of their schools. We want to help our students realize the value and the spirit of their school and country, and share with it with others. Facilitated by Cindea Hung in Taiwan. For more information, and to connect to the project forum, visit the iEARN School Uniform Exchange project page. 9. THE MAGIC OF WATER PROJECT. A four month partnership project teaching very young students (ages 3-5) about the magic of water. Water can be found everywhere in our environment and involves our lives in many ways. Now we are two kindergartens from Iceland and Poland. I invite your cooperation in September. Faclitated by Ewa Kurzak in Poland. Read more on the iEARN Magic of Water project page and Magic of Water Google site. 10. FINDING SOLUTIONS TO HUNGER PROJECT. In this project, we will share resources and ideas for teaching about the issue of hunger in our world and ways to become involved in making a difference. We hope to inspire participants to become active global citizens, working to create a more just and sustainable world. Classrooms will share what they learn and the projects they develop on this forum as we collaborate to end hunger and build a better world. Facilited by Judy Huynh in the USA. iEARN classes that participate in this project will be provided with a free copy of the Kids Can Make a Difference Guide, "Finding Solutions to Hunger: Kids Can Make a Difference." Thanks to iEARN-Argentina, this 255 page Teachers Guide has been translated into Spanish. For more information, and to connect to the project forum, visit the iEARN Finding Solutions to Hunger project page. 11. REGISTER NOW FOR THE NEXT SESSION OF iEARN-USA ONLINE PROFESSIONAL DEVELOPMENT COURSES FOR EDUCATORS. iEARN-USA's courses are open to participants from around the world - the next session will run from September 24th - November, 21st 2010. Each course is designed so that by the end of eight weeks, participating educators will have outlined how to use a standards-based iEARN project in their classrooms. 12. iEARN-END MALARIA CAMPAIGN 2010 BOTSWANA REPORT. "It's been over five years since students from Gaborone Secondary School, under the leadership of their patron Tommie Hamaluba, have embarked on a project to end malaria in Botswana. This year I share with you the success we had on our life-changing mission of malaria eradication. During this year 2010 the patron, ex-student leader Benson Kedumele and representatives from Burbank High in California, Dena Zelig and Doug Grimshaw, travelled for over 1000 km from Gaborone to Parakarungu for this year's campaign." See full report, written by Benson Kedumele from Gaborone, Botswana, on My Hero website. 15. 2010 NATURAL DISASTER YOUTH SUMMIT CURRENTLY BEING HELD IN TURKEY, AUGUST 23-27, 2010. The summit was started by the JEARN (iEARN-Japan) team, and has been held since 2005. Visit the NDYS 2010 Conference Website. Want to get involved? Join the year-round iEARN Natural Disaster Youth Summit Project, a project in which students learn the importance of human lives and how to cope with natural disasters through communication and collaboration with global friends. 16. ONLINE GLOBAL EDUCATION CONFERENCE, NOVEMBER 15-20, 2010. iEARN-USA is a partner in the event, and is encouraging iEARN educators worldwide to consider doing presentations. The platform that will be used is Elluminate. This is a great opportunity for you and your students to share how iEARN has enhanced your teaching and their learning. See a list of the different strands for the conference and a call for presentations. Be sure to mention you are a member of iEARN in your proposal. The date proposals are due is Sept. 16. As soon as your proposal is accepted it will be posted on the web site. Spread the word with other iEARNers! &feature=player_embedded" target="_blank"> 17. iEARN-TAIWAN TO HOST THE 18TH ANNUAL iEARN CONFERENCE AND 15TH ANNUAL YOUTH SUMMIT, JULY 17-23, 2011. The theme will be "Green Tech, Green Life, Great Era." iEARN-Taiwan announces "We are thrilled to invite all to Kaohsiung, Taiwan to join the 18th International Conference and 15th Youth Summit. Taiwan is a beautiful island with environmental and cultural diversity. Our foods, night markets and fruits are something you don't want to miss! 2011 iEARN Annual Conference will be held in the 2nd biggest city of Taiwan, Kaohsiung City. Kaohsiung is a charming harbor city with its hospitable citizens, pleasant subtropical climate and gentle ocean breeze. Come to explore the passion and vitality of Taiwan!" See a video preview, and stay tuned for details.